It's been a while since I have been a part of Pink Saturday, hosted by Beverly from How Sweet The Sound!! You can see some of my previous pink posts here, here, here and here. I thought it was the perfect timing to make a comeback, since I just found some very sweet pink pretties I wanted to share with you!! 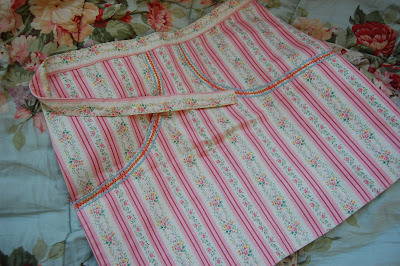 I love this sweet apron I found at an antique mall... The tiny rick-rack trim around the pockets is adorable!! 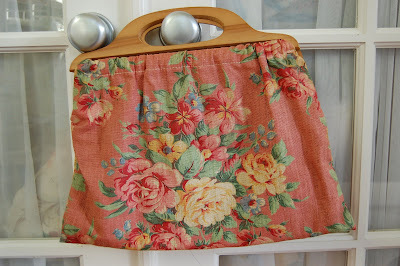 I have a large collection of vintage barkcloth knitting bags, and when I saw this one at Monticello for only $9, I didn't even have to think twice! 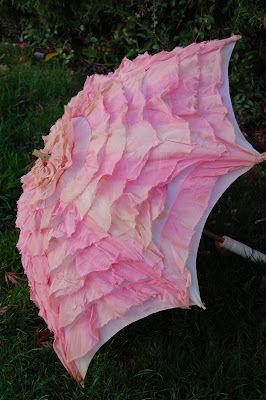 This is the sweetest umbrella ever! 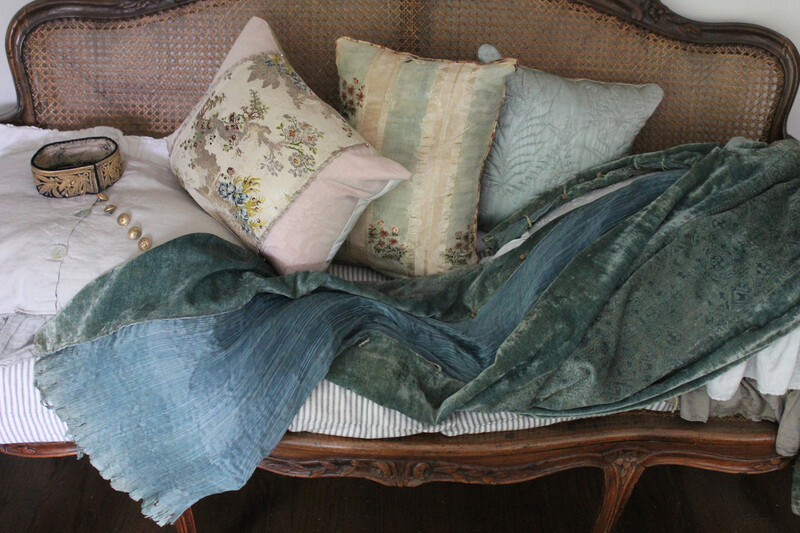 All those rows of fabric were hand sewn onto the base fabric, a true labor of love... I feel priviledged to be the owner of such a sweet heirloom!! Okay, so this is not so vintage, but it does have the vintage look!!! 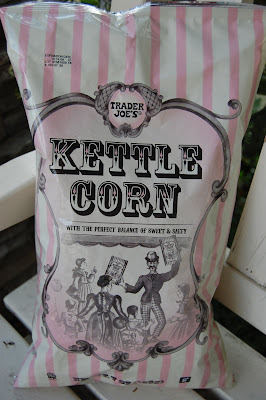 How sweet is this package...? I think I'm just going to put it on a shelf and tell the kids they'll lose their allowance if they even THINK about touching it... 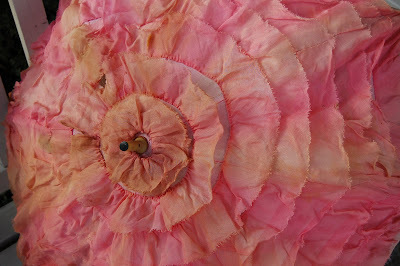 It comes to show you can find pink prettiness in unexpected packages! Have a wonderful Pink Saturday!! It was great to see you again tonight. What a deal on the barkcloth knitting bag...I'd say that's among your best deals this year? The umbrella is to fabulous to be believed! 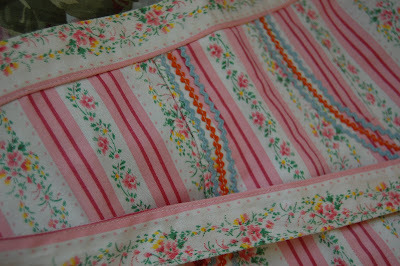 The aprons are pretty adorable too. Welcome back and have a Happy Pink Saturday! You do pink better than anybody!! I always feel better after a pink fix! Wonderful pinks from your collection, Isabel, for a pink Saturday. Absolutely beautiful pieces. That apron! 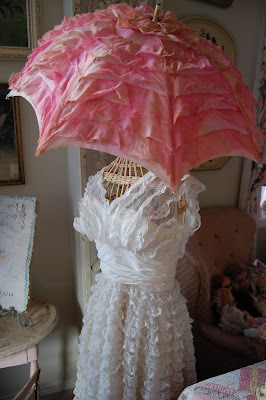 The parasol! Thanks for sharing them. Pink is my favorite color - no other compares, so Pink Saturday is the day when I can sit back, look at sweet pink goodies and visit some of the most lovely blogs in cyberspace. Thank you for sharing your pinks with me today. They warmed my little pink ♥. Wishing you a wonderful and blessed weekend filled with the love of friends and family. Great Pink Treasurers you have here! You have NO idea how much I covet your barkcloth knitting bags!!! 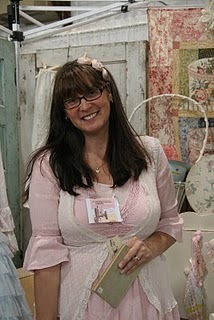 Have a ♥ filled Pink Saturday, and come on over to my blog and sign up for my giveaway! I’ve just found your site and i’ll be returning :) Great stuff! Love that pink umbrella! My first time here, lovely and charming blog! Pinkalicious...every bit of it...especially the last one! Cute pink things! Love the aprons! The umbrella is so beautiful. What beautiful photos and lovely Pinks. I have enjoyed my visit to your blog. Happy Pink Saturday and please have a wonderful new week. That pink umbrella is my favorite--and the white dress underneath it--perfect and perfect for each other. Enjoyed my visit! I am in love. I do believe that I JUST died and went to rose/pink heaven. Love your site - I am now a follower. 200th post Giving Thanks Giveaway!! !